The quick thinking and intervention from two third year Warwick medical students was vital to a young boy when he came to the Emergency Department at University Hospitals Coventry and Warwickshire (UHCW) with worrying symptoms. 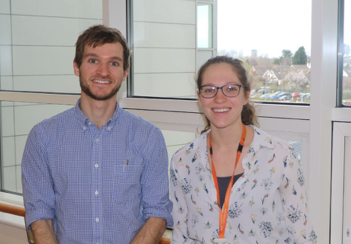 When George Godfrey-Faussett and his clinical partner Emily Drage reviewed the patient they noticed that he had a subtle rash, which set alarm bells ringing when combined with other symptoms including a fever and an elevated heart beat. This speedy intervention from the students allowed the case to be quickly elevated to the Paediatric middle grade doctor and confirmation that the child had meningococcal sepsis, which required immediate intervention. The four-year-old was able to quickly receive appropriate antibiotics and was discharged three days later with a clean bill of health. George says: "I'm very happy that the child received the treatment they needed and has since made a full recovery. The team in the Children's Emergency Department are fantastic and the registrar on duty was very receptive, acting rapidly when we raised our concerns." The boy’s family were incredibly thankful to George and Emily, and the Paediatric department has also extended its thanks to them both. Dr Prakash Satodia, Consultant Paediatrician, says: “We are grateful for George and Emily’s actions, their quick thinking was vital in making a potentially lifesaving decision here and we are delighted to have students such as them working at UHCW."